party school-embrace it or deny it? Although we are well into the Fall 2010 semester this is a topic that will never be dropped. Prior to the opening of a new school each year, typically in April, the Princeton Review releases its annual college rankings. Topics such as “top jock schools,” “best college town, and “happiest students” are among the numerous categories presented in each publication. 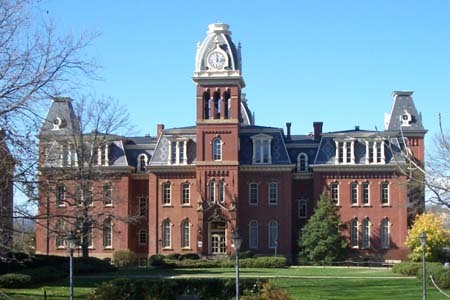 In 2010 West Virginia University was granted the position of No. 2 top party school in the country, right behind the University of Texas-Austin. Notoriously known for its high rankings on the list the image of WVU is affected all the time with demeaning consequences and rash interrogation. I see this on a daily basis. Students at WVU can be found embracing the party scene really on any given day during the week. Conversations that resonate in classrooms really do revolve around “going out.” Basically, slang for drinking and hitting the clubs. Now, don’t get ahead of youself and think that I’m an advocate for this outlandish mentality. I don’t just tell parents that we are a party school and leave it at that, there is much more. The clear answer, while being yes, goes back to the student themselves. The main objective for going to college is to get a first class education in hopes of brightening personal horizons and landing a rewarding career. That’s not to say there isn’t time for fun along the way. There are many opportunites for life skills and advancements at WVU and there are so many facets of this University that students should take advantage of. But its not just at West Virginia. Really, college itself should be considered a party. No matter where you go across the country campuses are going to have parties, its part of the college lifestyle. Its just up to the student to balance the fun and studious sides of being a college student. In 2007 when WVU was regarded as the No. 1 party school in the land then-president Michael Garrison refused to acknowledge the title or give any comment on the issue. That was not the proper way to handle it. This new regime, led by president Jim Clements takes on a different attitude, the right one in my opinion. “If you look at this (party school) list, most of the universities that are on it each year are large, public universities with very strong academics, research and outreach, and also major athletic programs that have achieved great success,” said President James Clements in a statement. Clements brings up an excellent point. Why not embrace this fact that Morgantown is a great place to study and have a good time. The NBA season got underway last night. All 30 teams begin anew with fresh players, regained talent and unparalleled desires to win a championship. 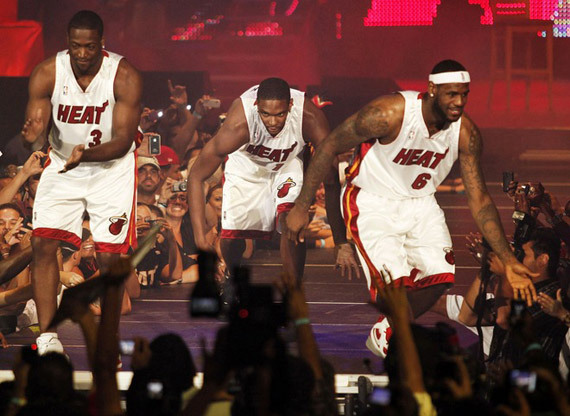 No team made more noise this off season than the Miami Heat. The James saga has been one of the most controversial movements in sports history. Growing up in Northeast Ohio James was seen as a basketball immortal tabbed for greatness since his early high school days. As the first overall draft pick in 2003 he went to Cleveland, less than 30 miles from his hometown of Akron. The hometown boy carried the Cavaliers until this past summer. In a made for TV, hour long event James showcased himself to the world by announcing where he would sign a free agent contract. The program was seen as self-centered and flamboyant, but nonetheless unique. Bud Shaw, columnist for the Cleveland Plain Dealer wrote an article demeaning James, as well as ESPN for broadcasting the event. LeBron James may have set a dangerous precedent. Not the creation of super teams in the NBA. Many believed he would show loyalty to his roots by staying in Ohio, but speculation abounded that he would choose the bright lights of a larger media market. Drawing criticism not only from Clevelanders but noble human beings world wide, James took matters into his own hands and did what was best for himself. Personally, I don’t blame him. 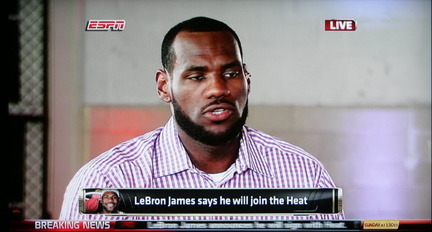 James took less money to join the Heat and set himself up for the best chance of winning a title, the ultimate symbol of success in the NBA. Throughout the summer leading up to yesterday’s opening day James was trashed left and right and his image was tarnished as he was seen as a villain, a cheat and a backstabber to his true loyal fans. He established a twitter page (@KingJames) to promote his clothing line, the Heat and himself. He utilizes the outlet on a consistent basis sharing his thoughts on how he handled the situation as well as updating fans on his daily routines. Throwing himself into the fire of social media gave pundits of James the opportunity to mention him in harmful tweets. This didn’t faze James one bit. In the week leading up to opening day James re-tweeted many of the vulgar and rude mentions he has received over the course of the summer. James’ biggest splash came earlier this week with the release of a new Nike commercial pinning him in the limelight once again. He has drawn rave reviews from all reaches including sports talk shows, twitter and The Huffington Post. This needed to be done and James definitely may have won some people back on his bandwagon. He may not have wanted them, though. James was straight-forward and honest, the best recipe for a better image. I honestly don’t think college students could survive without Facebook or Twitter. The social media takeover is not just for the regular old frat boys, prude girls and hippies that pay tuition and keep universities running. It is an outlet for athletes as well. Nearly every member of the WVU basketball team has a twitter that is utilized regularly. Perhaps no WVU student is followed more religiously than John Flowers (@jflow41). He communicates eloquently with teammates such as Joe Mazzulla (@JMazzulla21) and Truck Bryant (@TruckBryant5). Viral videos of the team fooling around in their hotel rooms during the March Madness runs surfaced turning the Mountaineers into internet sensations, showing just how fast information flies online. Ivan Maisel of ESPN.com has realized this and offers a warning. His article, Faster pace of football affects dynasties, talks about on the field and off the field issues that have altered the dynamics of college football in recent years. The internet is one of those explanations. College athletes are scrutinized under a tight microscope, now more than ever. The access media outlets have to programs can eithe help or hinder the players based on their behavior and achievements. Facebook and twitter is a complete other issue, and really is a two-headed monster for college athletes. Now fans have a scope inside the lives of these youngsters and poses certain dangers. Miami coach Randy Shannon outlawed twitter from his teams after quarterback Jacory Harris was found mentioning upcoming opponents players. Shannon found that this not only posed a threat to Harris, but also other teams as well. According to Maisel, he made the right decision, but it didn’t come easy. What does America love more than burgers and beer? At one time it was baseball, hot dogs, apple pie and Chevrolet. Today, those two delicacies pretty much can be found in someones hand at any given time and any given place. From personal experience burgers and beer are right up my alley too. Hey, is it 5 o’ clock yet? What is the attraction to these two long standing icons of the dining experience? A lot of it is the mentality. The thought of biting into a juicy cheeseburger while washing it down with an ice cold draught is bound to stick in anyone’s memory. Two products have recently taken a different route, though. McDonalds has long been an institution known for quick and cheap eats. The Big Mac, chicken nuggets and golden french fries are all tasty treats everyone has experienced at some point in their lives. It really is the same old routine. When I first watched some clips and saw signs and billboards I was skeptical. The campaign completed removed the mouth watering goodness of the traditional McDonalds food. I really don’t care to stare at this guy who keeps changing wardrobes and smiling at me. Then I got to thinking. This really is a brilliant idea because it does stray from the mainstream McDonalds mentality that has lasted for generations. It is well-documented that McDonalds if often associated with negative connotations surrounding its health and nutritional values. It is often seen as an “obese people food” and not meant for someone with high class or sensitive dining preferences. “Come as you are” helps abolish that persona by welcoming all patrons to enjoy their classic food. After all that enjoy an ice cold beer. Dos Equis is relatively new on the scene in the alcoholic department. Although first brewed in 1897 it really hasn’t taken flight until two years ago with the introduction of this guy. 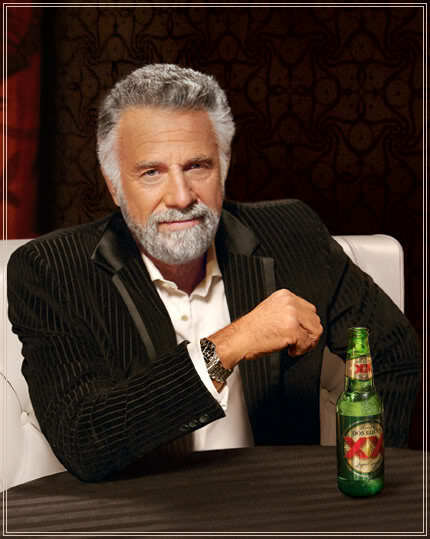 The epitome of class “the most interesting man in the world” is now one of the most recognized men in the world. Once again, thanks to Euro RSCG, a new way of traditional thinking has been implemented into the minds of consumers everywhere. Even though it was originally brewed in Germany, and now in New York, Dos Equis is seen as a refreshing Mexican beer. With a sweet, smooth taste and noble hoppy and corn finish it is very comparable to a Corona or Landshark. It did not want to be seen this way. By straying away from the tropical theme of beaches, ocean and relaxation the company helped Doq Equis form a distinct image with an “interesting” flare. The unnamed man is portrayed as an adventurous individual who is revered and respected by all who come in contact with him. When the day is done he reaches for a Dos Equis, although he doesn’t “always drink beer.” This spotlight may be the most unique campaign out today it. While the quirks are always churning the message stays the same. 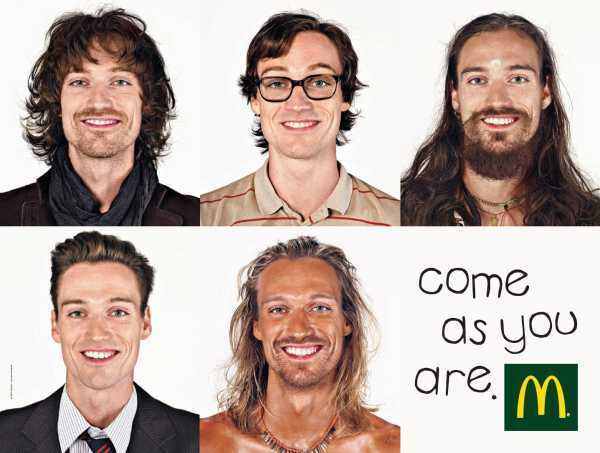 Being different is standing out recently and these two campaigns signify that right now. Although it doesn’t rhyme, it still rings true. I’ve long been told that in any career, connections are the key. Public relations is obviously no exception. For the past year I have held down a job at the West Virginia University Visitors Resource Center as a tour guide. It has been an exhillarating job showing perspective students and their families around our beautiful campus. It is very rewarding talking to people from all around the country while showcasing the university I hold near and dear to my heart. Many of my friends say “anybody can do that job, its just pointing out buildings.” It is indeed that, yet so much more. I feel the job is about establishing a connection and forming cohesion with my group. Typically tours consist of anywhere from a family of two to 55 people. Everybody is special in their own way. For the duration of the two-three hour tour I am their gateway to WVU. Whatever I say could (and should) have an effect on their ultimate decision of attending WVU. This special connection should be evident in PR as well. The client-practitioner relationship should be open and honest. Also, the person in charge assumes a role that can either make or break that bond that needs to be formed in order for a manuever to be successful. It is also a two-way street. Schwartz also expresses fun when dealing with the client-PR relationship. It is a lot of hours of work but why not make the tedious tasks a little more enjoyable? The whole process goes both ways with each side helping the other. Making it the most thrilling experience it can be allows for the client to receive excellent noteriety and the firm to obtain a lasting repuation. The job is a lot of strenuous research and developing, but in the end, its all about establishing a connection. My name is Matthew Peaslee and I am a senior PR major at West Virginia University. This blog is designed to track my career in the world of public relations while sharing useful tactics and ideas that I have observed or obtained. Well, isn’t that why anyone gets involved in a subject they enjoy? My track to public relations is somewhat unique. As a graduating senior from Ursuline High School in Youngstown, OH I knew journalism was my calling. From the time I could say “football” I knew WVU was my detined home. My father, a 1980 graduate, took me to home football games since I was nine years old. “Only then could I fully enjoy the experience,” he said. College is more about football, though. And as hard as it is to believe West Virginia is more than the old gold and blue clad Mountaineers. The nearly 30,000 students in Morgantown are here for an education. Back at Ursuline I wrote for my dinky high school newspaper. Only published once a month, The Irish Times, was a far cry from a literary masterpiece. Nonetheless, I enjoyed covering all varisty sports including the 2004 State Champion Fighting Irish girl’s basketball team. The high school paper certainly got my feet wet in terms of starting my journalism career. I have always been entertained by all facets of the media so the P.I. Reed School of Journalism was a no-brainer as I enrolled as a direct admit to the program. I enlisted as a Broadcast News major. Two years passed and I decided to make the jump from BN to PR and never looked back. Public relations is a more well-rounded field in terms of media involvement, I feel. With broadcast students are pretty much honed into specific skills that are used only in television, radio, etc. PR is a larger scope with many options. As a die-hard sports fanatic I wish to one day work for a sports team as a Director of Communications or Media Relations personel. That being said, college has been the best four years of my life. University relations is also a field that I thoroughly enjoy. I have deep pride for my university and would love to share that with the world. So strap in as I begin to follow this journey in the world of public relations.